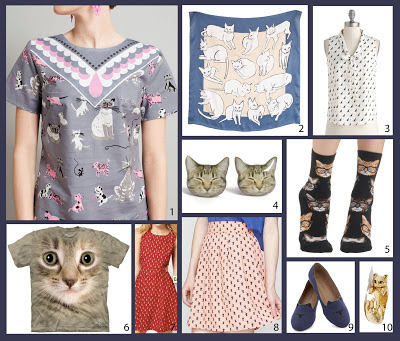 Every good spinster needs an amazing spinster wardrobe. Today we shall have a look at some of your options. 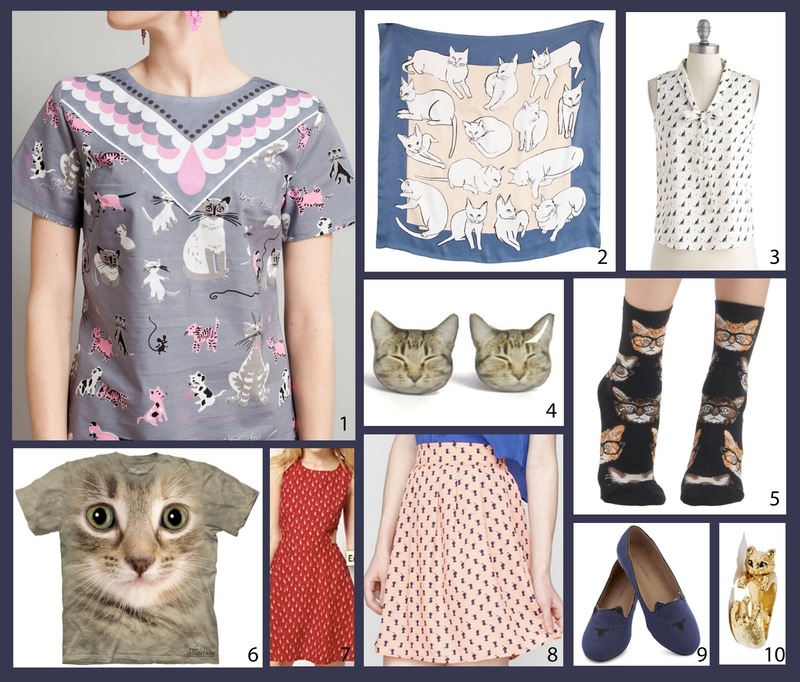 Above you'll find a little collage I've put together in my sickbed of the wearable cats that are currently available. Enjoy! 1. Woven Cat Shirt. Perfect to wear with a pair of ankle-length jeans and some flats or woven sandals. 2. Square Cat Scarf. I recently bought different square cat scarf from Madewell, and I wear it all the time. It's the perfect finishing touch for any spinster ensemble. 3. Cat Print Blouse. Great for work with a skirt, some tights, a cardigan, and a cute beaded necklace. 4. Cat face earrings. So cute for every single day. 5. Cat socks. Because every spinster needs a pair of fun socks. 6. Cat Face Tee. I have one of these, and I wear it way more than I ever thought I would. I also have the one with the wolves, the dolphins, and the unicorns. These tees are a little addictive. Be warned. 7. Cat Printed Dress. A good spring/summer day to evening dress. 8. Cat Skirt. I would say this was great for work and date night, but since we're spinsters here, I'll say "great for work and a night out with other ladies." 9. Cat Smoking Slippers. Wear without socks or with fun socks and ankle pants. I recently bought a bright pink pair of these. 10. Cat Ring: Madewell makes a real effort to cater to both cat and dog people, but I secretly think they are mostly cat people.